Balcony projects are becoming more prevalent with house builders maximising space by using the outdoors, it is becoming common for the tiling in the inside to be carried through onto the balcony or the balcony be tiled in it’s own right. In renovation projects, the balcony area usually has an Asphalt surface which cannot be tiled directly onto due to the high level of movement anticipated – it would cause the tiles to “tent” or become loose from the Asphalt. 1. 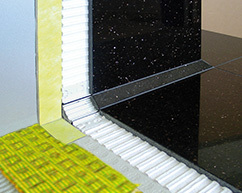 The substrate must be sound and capable of withstanding the load to be carried without vertical movement. 2. 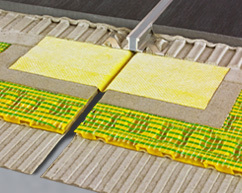 The adhesive used to bond the CI+ matting to the surface must be capable of bonding to the Asphalt and making a mechanical bond with the fleece on the underside of the CI+ matting. 1. Using an adhesive suitable for fixing onto the substrate and following the adhesive manufacturers advice for any priming or surface preparation, apply the adhesive to the surface using a 4mm notched trowel. This should provide a bed of 4mm width x 2mm height ribbed adhesive. Take care to ensure that the adhesive bed is even, without excess in any depressions in the surface. Do not attempt to use the adhesive as a leveling compound. 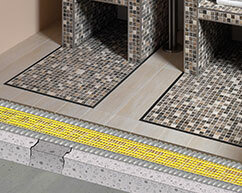 If too much adhesive is present, the result can be that the underside of the matting will become filled with adhesive and the product will not be able to function. 2. Using a flat grouting float press the matting firmly into the adhesive bed. 3. The aim should be to achieve good adhesion to the fixing webbing without filling the cavities in the underside of the membrane matting.